The painting below, attributed to Wu Wei (late 15th c.),2 is very similar to the scene at right, by Ni Duan (early 15th c.). The inscription at the top of the Ni Duan painting dates from the Qing dynasty. "Casting a net" is in the title of section 15 of the <1491 Yu Ge as well as of section 12 of the 1525 Yu Ge. Ni Duan (824.52, style name 仲正 Zhongzheng) was a native of Hangzhou. The original of this painting is in the National Palace Museum, Taipei (see online). The painting is described in Possessing the Past, Treasures from the National Palace Museum, Taipei, 1996, pp. 348-9. Wu Wei (3453.510; Bio/1030 明湖廣江夏人，字次翁，號小仙，又號士英、魯天) was from Jiangxia in Huguang, style name Ziweng, nickname Xiaoxian, also Shiying and Lutian. As for this painting, on the right side one can see the signature 小僊 Xiao Xian. In spite of this, and all the imperial seals, some think the painting is a 19th century forgery. The photograph was made through a glass frame, hence the quality. For more on Wu Wei see in Wikipedia. He painted a great variety of subjects. Those showing guqin include this portrait of a lady qin player. 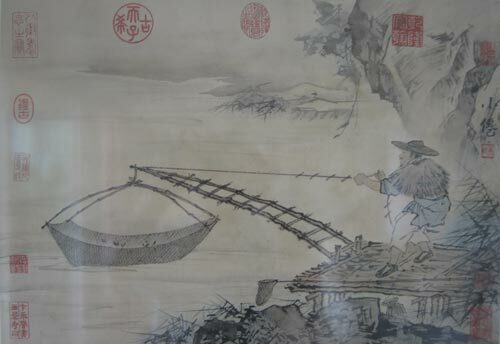 He is also credited with a 漁樵琴酒圖 painting of Fisherman and Woodcutter with Qin and Wine.